When you sleep with your partner, do you prefer sleeping really close to him/her, or you tend to sleep on separate sides of the bed? 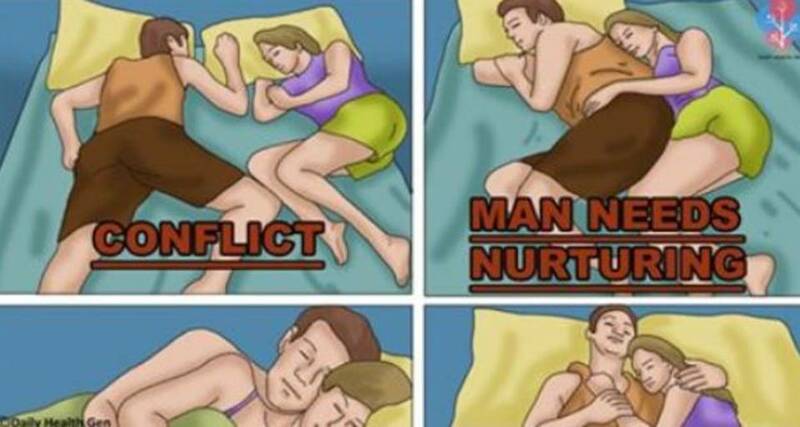 Are you the spoon type of couple or do you lay back to back? If you both like sleeping on the opposite sides of the bed, it could mean that you’re distanced. However, if this happens from time to time, it just means that you both need a good night’s sleep. This could indicate that one partner needs space whereas the other craves more intimacy. If you both sleep on the back, with the female’s head in the crevice of the male’s shoulder, it could mean that this woman is dependent on her partner. If you sleep in this position, that is, face to face, but without touching, you could be in need of more conversation and contact in your relationship. When the male sleeps on the back, whereas the female is laying her head on his chest, the relationship has recently begun. If you and your partner sleep face to face, the legs intertwined while trying to fall asleep, you’re independent, intimate, and sexually active. This position indicates that the male is in need of love and care. This signifies that the male is protective and loving of his partner. If you and your partner sleep back to back, it means that you’re comfortable in your relationship, intimate, and completely relaxed. If you sleep back to back, but your backs aren’t touching, it means that you are connected to each other, but you’re still independent.